Rabbit Stew: The big question: .177 or .22 for Rabbit Hunting? 177 or 22? That - a swift peek at any of the popular airgun forums will quickly assure you - is most certainly the question. To cut to the chase, the answer's 177. Why? Well: it seems to boil down to trajectory - the parabolic path that a hopefully rabbit-bound pellet describes after it leaves the barrel of a rifle. It does not go in a straight line, I learned to my surprise, and then drop when it's tired - it inscribes, instead, an arc 'twixt gun and rabbit. But if it does that, then it's not simply a question of 'point and shoot' at all; distance becomes a crucial factor. How can you predict where in its arc your pellet is going to be when it reaches the head of the rabbit that you wish to shoot? Because if it's an inch too high then it will miss, and if it's an inch too low, then it will miss again. Nightmare! 177 pellets have a much flatter trajectory in the 40-odd yards after they leave the rifle barrel than 22's do. It's as simple as that. You can arrange it - I gather - so that in the area, say, between 20 and 35 yards (the crucial area within which the vast majority of relatively humane air rifle shooting is going to be taking place) the pellet will deviate from an imaginary straight line drawn between the end of the barrel and the rabbit's brain by a matter of only so little as half an inch or so. A 22 pellet, on the other hand, will be drawing a line that looks like the path of an amusing roller-coaster ride. This I learned after I blew all the cash I had to spare on a 22 rifle. If you want to have a gander at some parabolas, head over to http://www.chairgun.com/ or to the ballistic reticle calculator (superb name!) at http://www.hawkeoptics.com/brc/index.php and download the free software. The happy medium and ideal calibre for a spring/gasram hunting rifle. As it has a decent whack with a flatter trajectory than .22 and the fact that .177 losses its advantages on a Springer. So since you habve the hw 80k in .22 I think it is?! .177 does not loose its advantage on a spring rifle. Not sure what you've tried but the kick/recoil on a .177 springer from AA/HW or the LGU has vlittle recoil. The LGU is so slight most people who've shot 1 say you can watch the pellet strikecthrough the scope. Yrs ago .177 were very twangy hense why I shot .22. But these days even a modest vmached spring rifle in .177 can match pcp for accuracey. Before y asked. Shot 18 woodies resting off a table top and fence with my dads ProSport in .177. That rifle is so spot on out of the box. A slight nudge when fire and if I'am honest easier on the recoil compared to my .22 Fenman. That's very interesting, thank you mate! All calibres have a place in air gunning, shooting pigeons from inside a barn up in the roof for instance would be ideally suited to .22 cal as .177 would pass through the bird and into the roof. Very true & very kind of you to point it out! Well tbh a .177 in spring form has not more recoil than a .22. Fired a TX200 and the Prosport, the latter being my farthers rifle. Both .177, then fired my .22 TX200 HC. Theres was no difference between the recoil, both were very low. If you hug any springer too much then this does make it kick, using the artillary(excuse spelling) hold then most springers hardly recoil. As for .177 passing through a target. Never had that issue. Took 3 woodies out of my farthers tree with his .177 Prosport. Never had a pellet pass through them and they were all head shots. Even a .22 will pass through if its fired within a certain range I.E. close. And those pointed pellets are just the worst pellets I have used for hunting. Too much penetration which just ment the pellet took 95% of its killing energy with it. I do prefer dome style pellets, as these tend to flatten after they hit thus putting all the energy where it matters into your intended prey. But as I find with Air riflehunting everyone has their view/ideas about it lol. Thanks for posting your thoughts and experiences here, Jason! It's always interesting to hear what other field shooters have to say. I fully understand the trajectory discussion and the .177 makes sense there but at 40yds (the sort of shot i will be making) would both sizes kill the target equally (only head shots)? Basically which calliber would you go for if you were me. At that kind of distance I'm still pretty sure that a .177 is what you need. I think you'd unquestionably do better with a bipod too. 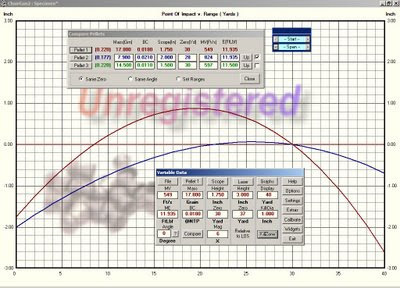 You'll still need - of course - to do a good deal of practice on paper targets before moving on to your intended quarry - but getting to the stage where you can consistently group within one inch at 40 yrds with a HW100 shouldn't take you too long. That is a good graph to show that velocity is important. If you targets are close then a .22 is good. I like the pellet options for .177. Thank you, Lee, glad to be of help. Those TX200's are superb bits of kit: best of luck of with it! Choose the Beeman dual caliber rifle, with interchangeable barrels in 177 and 22. reasonably priced, comes in RS1/RS2 and RS3, in either blue or stainless barrels, fully adjustable triggers, and either a 4x32, 3-9x32 or 3-9x40 respectively, priced between $114 to $229 for different models and all but the cheapest include a carrying case for when broke down. Isn't there an argument that .22 would transfer more energy to the quarry? We can assume initial energy of the .22 and .177 pellets are the same since both are governed by the same laws. .177 is allowed to travel (much) faster than a .22 because of its smaller mass. The only (major) energy losses going on between the muzzle and the target are from air resistance which is proportional to the frontal area and, more significantly, to v^3. Therefore the faster moving .177 will slow down proportionally more than a .22, so will have lost more energy in flight. A .177 will therefore be unable to deliver as much energy to the quarry as the .22 because of increased losses, thus resulting in less trauma and damage, added to by the smaller pellet bumping into a smaller amount of tissue in the animal. However I take the point that you can at least hit the prey more easily at different distances. If you miss judge your range with a .22 at 40 yards then there's a good chance you'll miss or wound the rabbit. A .177 zeroed at 30 yrds will be half a mil high at 15 yrds and half a mil low at 40 yrds. So as long as you are within 40 yrds you'll need little adjustment to land a pellet in the kill zone. A well known writer for airgun mags has done yrs worth of research into pellet damage at the 12ftlb legal limit. A .177 mid weight/grain round/dome pellet delivers as much impact damage as a .22 14 grain. So going on that .177 would win the argument pre FAC. Can be found on ytube. Fieldsports channel has the video or is a part if the airheads video. When watching remember the 1st .177 nold he makes then the .22. Near the end when he sums up and gives his pellet size of choice look at the mold taken. Cannot link vid due to at work and using my mobile. Will post when I get home. Makes alot of sense. But I've shot .22 air rifles since I was in my teens. The loop flight of the pellet does not take that long to learn. 30 mins after y set your zero be it 25 or 30 yrds, then just set targets from 15 to 45 yrds and record where the pellet hits. You have to aim at the bullseye without adjusting and write down which mil dot on the hold under or over(up/down)the pellet hits. Most if not all people can shoot well with .22 the issue is range estimation, this is what lets down a large% of shooters. Hense why .177 is becoming popular because you need minor adjustment and range estimation mistakes are punished less. Thank you, Jason, for these very well informed contributions to the discussion. .22 has a less flat trajectory, but this consistant and there fore predictable. windage, the effect of wind on the pellet, is inconsistant, so unpredictable. .177 is more affected by wind. Given this, and the fact that .22 retains much more energy down range, I would say you chose the right calibre. I think you've got a bit of a cheek with your "the answers .177" after a bit of a look at an airgun forum. A bit of research would have told you that either is fine as long as you hit the animal in the head. Hiya Adam, Thanks you for your comments, they are most welcome! In fairness though - and a look at pretty much anywhere on the internet will confirm this - it's *my* blog and if I want to come out with claptrap, poppycock, slander, downright lies or misinformation here then it's a free country (unless it isn't) and I'll do as I please! So 'cheek' isn't really the issue. But - more seriously - this really wasn't an opinion I came to after one-handedly perusing a few forums, I came to it after a lot of fieldwork with a .22 springer and then a lot more fieldwork with the same rifle modified to .177. There's a lot to be said for either for sure but that flat trajectory with the .177 is just true and it makes a *big* difference. Fair enough, I was just about to delete my hasty comment. Its not true to say that .177 has a flat trajectory though, its just flatter than .22, and more affected by wind, and not as hard hitting.